Veronica has a bachelor of Applied Science (Biology) with Honours and a PhD in limnology/environmental science. While the focus of her studies has been in the aquatic stream, she has experience in ecological studies for the Australian arid environment (botanical and zoological). For the past 25 years, Veronica has been working as an environmental scientist, with 15 of those as an environmental consultant. She have extensive experience in the assessment and management of Western Australian wetlands, in particular arid zone wetlands, both surface and subterranean – working across Resource, Urban, University and Government sectors. Veronica has a passion for working with egg and seed banks and using adaptive ecological monitoring tools to understand arid zone wetlands. 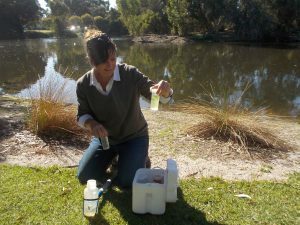 Her experience ranges from studying Cyanobacterial blooms in Western Australia and New South Wales, stromatolites and microbial mats in estuarine lagoons, rivers and estuaries, and inland waters throughout Australia. A large component of Veronica’s research was identifying the reliability of using the Australian endemic brine shrimp, Parartemia, in hatching trials as a biological assessment tool. The project required the development of adaptive monitoring techniques to achieve the objectives when WA entered into a drought in 2002. As a result of her work on Parartemia and the contribution to their conservation, Prof. Brian Timms named the species found in her research lake, Parartemia veronicae!